1. The location at which service cables installed by an electrical utility company joins the customer’s service entrance conductors in one or more terminating enclosures. 2. The location at which a customer’s service entrance conductors joins the electrical utility company’s facilities in a transformer, vault, or enclosure. 3. 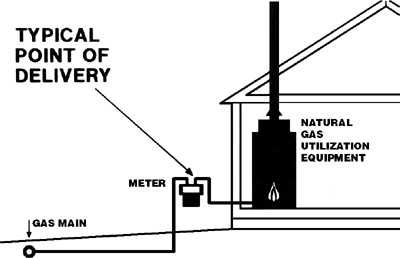 The initial junction of the customer’s gas piping with either the gas company’s piping extending from the gas main and/or the regulator which reduces the pressure of an undiluted liquefied petroleum gas to the pressure normally delivered to appliances. BEIRUT: Owners of gas stations in the northern region of Wadi Khaled blocked the main road to the area Monday to protest a UNHCR decision to relocate delivery points for its fuel assistance program elsewhere. By 2003, the firm anticipates 10% of online shoppers in the UK will have Delivery Point installed. Second, the Address Quality Hub's Delivery Point Correction Module provides the industry's first solution to correct the primary house number required for automation discounts by automatically matching name against street address, and correcting bad addresses. Deora said outstanding issues with Pakistan, like transit fees, are less important, saying: "These issues can be resolved easily, but the main issue is the delivery point. And, with 91 percent of delivery points in the United States classified as residential, it helps to know what the rate will be before shipping. Deliveries to Talisman have been as high as 750 Mcfd, and are currently about 350 to 500 Mcfd (with the company's compressor and Maybees delivery point operating). Delivery Point Validation(TM) (DPV) will help mailers, publishers and other businesses save money on postage, reduce undeliverables, and store customer data with more confidence. In the first phase Itron delivered an advanced meter data verification and estimation system (MVES) that collects unedited "tele-metered" delivery point load data from ODEC's delivery system. The Company has experienced a partial shut-in of the Lake Washington Field that is expected to last approximately two weeks, and possibly longer, due to a third-party oil pipeline incident, which resulted in a disruption of operations and requires an investigation downstream of the Company's primary delivery point in the Lake Washington Field. 0 million cubic feet of natural gas throughput per day from traditional and coal bed methane wells - it is of strategic importance to us as it will provide an additional delivery point onto the Texas Eastern Pipeline, a major interstate gas transmission line.